The gorgeous Pezula Hotel in Knysna is set in one of the most idyllic settings on the Garden Route. The views, luxurious Suites and rooms, Championship golf course and stunning spa already make this hotel an experience second to none. And now, with the addition of a new team at the helm of the restaurant and bar, there will only be more reasons to visit the hotel! 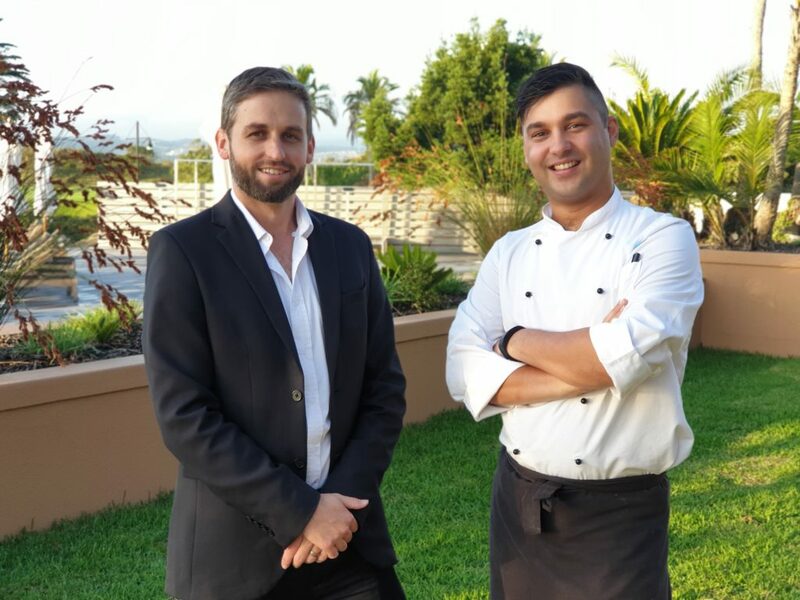 We recently caught up with Jacques Fourie and Russel Braum – new Chef and Food & Beverage manager respectively – to hear about their careers, their passion for the hospitality industry and what makes them tick! My passion for food started at an early age. My grandmother loved to bake and she had a very good Malay friend who would invite us into their home over some weekends to enjoy their amazing cuisine. I simply fell in love with the aromatics walking up the stairs of the flats while smelling the beautiful aromas. This is something that I will remember for the duration of my life. I started my career at Fancourt Golf Resort and Lifestyle Estate at the ripe age of 16, after working as a casual chef for about 2 years, before procuring my first permanent position whilst being part of the opening team for the Fine Dining restaurant The Links Lodge – we procured top ten restaurants of the Garden Route. During off season we closed the lodge and moved back to the main hotel where I formed part of the opening team for the newly refurbished Henry Whites fine dining restaurant (previously African cuisine restaurant, Zanzibar). Once I had done my term in this department, I was transferred to the pastry kitchen for the entire hotel’s operation. It wasn’t long before I found myself running the pastry department for the hotel. This was an amazing experience and was essential to my current success, as generally pastry chefs are specialized and focus on this for the duration of their careers, whilst I now had experience with various cuisines and desserts as well. After Fancourt I moved onto Cape Town, where I did a short stint at the Lord Charles Hotel in Somerset West. After this, I moved back to George where I received my bursary from the Department of Tourism, where I studied at the Eden School of Culinary Arts. I received the top achiever award in 2012, and also participated in the Chaine des Rotisseurs Young Chefs compétition where I was awarded 2nd place to a very experienced Chef! I was extremely happy with this result, as this was the first time that I tried something like this. To reach that achievement made myself and my family extremely proud. I then started working at Simola Hotel and Spa as the Sous Chef, where I retained this position for approximately 2 and half years, The owners and General Manager then offered me the opportunity to take over all kitchen operations as Executive Chef. I stayed on here for another 1 and half years until deciding to finally make the leap to pursue one of my dreams…. I boarded a plane to fly to France to board the Crystal Symphony Ocean-liner vessel. I did a 6 month contract here, leaving my son and fiancé behind, which was really difficult, but this was a choice that needed to be made for the better of my career and family life. Once I finished my contract with Crystal, I joined the Seabourn Odyssey (currently rated the number one cruiseliner in the world) where I took the position of Officer Executive Sous Chef, representing Michelin Star Chef Thomas Keller. I was designated to recreate Chef Thomas Keller’s dishes aboard the vessel to the highest of standards and send daily reports to Chef Thomas Keller himself. I loved working here, I learned so much – not just culinary orientated – but as a person as well. Chef Thomas Keller sets certain values to his cooks, values that I hope to bring to Pezula Hotel. I simply love this industry! There is no other like it wherever you look. The uniqueness of what we do is like another language that, if you don’t know it, you wouldn’t understand it. We deal with all types of cultures and cuisines where everyone is entitled to their opinion, everyone has a different set of taste buds and preferences which creates daily challenges and goals. Let’s not forget the ever growing personal dietary requirements which creates challenges of their own. The industry is forever changing; not so long ago the world didn’t have any idea what molecular gastronomy was, but it took one chef to introduce it to the world, and now it is on everyone’s lips. Who are your industry icons? Thomas Keller inspired me to be a better me; his values will forever be a part of me. Gordon Ramsay is trend setter in our industry, his numerous Michelin stars, his attitude toward perfection is like no other. Jamie Oliver made chefs all around the world famous. He introduced what we do to the public, allowing anyone who was willing to learn the opportunity to become an amazing home cook. Heston Blumenthal introduced the world to molecular gastronomy. I think that he made millions realize that food is a science. He also is the owner of the Fat Duck in England which was awarded the number one position in the top 50 restaurants in the world. What are your plans and ambitions in your role at Pezula Hotel? My plans for Pezula Hotel include sustainable local produce. I am putting plans together for a beautiful herb garden which will help in this respect. We also do our best to source produce from local farmers as far as possible. Ultimately I would love to create menus that anyone would be happy to enjoy; simple food made exquisitely and presented beautifully. My grandfather always said it is not what you do, but how you do it that makes the difference, and this applies directly to culinary arts. If you have the passion, and are ready to learn from those around you, then it does not take much to create beautiful dishes. Any interesting facts about yourself, your career or your family? An interesting fact about me is that I have a son with my fiancé! He will be turning 7 years old on the 23rd of April and we are awaiting a baby girl in August. My son loves to help me in the kitchen and is always interested as to why I do what when I am cooking at home. I was born in Durban and moved to Newcastle in Northern Kwazulu Natal at the age of 5, where I started school in a co-ed Catholic convent school. I started showing a natural musical ability from a very young age, which eventually lead to my acceptance into the Drakensberg Boys’ Choir School in 1996. During my 4 years here, I was lucky enough to travel to several countries and experience various cultures and interact with musicians from around the world. I matriculated from Kearsney College in 2002, and went on to complete a Bachelor of Music Degree at the University of Kwazulu Natal in 2007, majoring in Jazz vocals and music education. My first introduction to the hospitality industry came when I worked as an Entertainment Host on the MSC Rhapsody in 2006, and the MSC Melody in 2007. In mid-2007, I accepted a position as a function coordinator at a 5-star guest house in Durban. At this point, the hospitality bug bit! Since then I have worked as a game ranger in Northern Natal, Assistant F&B manager in the eastern cape and F&B manager in Ballito (KZN North Coast). I have also been a part of the opening teams of several KZN iconic restaurants, including the Big Easy Wine Bar & Grill in Durban, and The Chefs Table in Umhlanga. Our industry is about people. Entertaining people through curated experiences. We interact with different guests daily, who all have varied needs and expectations. This creates an environment that changes consistently, and navigating the challenges is extremely rewarding. The other half of the equation is the people we work with. To be successful, you need to be able to build and maintain a motivated team of individuals, who ultimately are the heart of any establishment. Soti Sonitis and Sean Gray, owners of The Chefs Table in Umhlanga. Their passion for the industry is infectious. Their vision and execution has been refined by decades of experience, and they inspire everyone who is lucky enough to work with them. Pezula has a reputation for being a world-renowned destination hotel. I would like to see that name upheld and supported by a world class Food & Beverage offering. The Garden Route has a wealth of local producers which we will continue to support as much as possible, and in doing so, continue in our commitment to local sustainability.